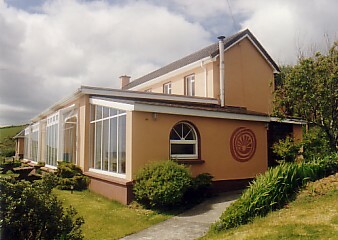 Lios Dána Lodge is set on the side of a hill facing Dingle Bay and the Atlantic Ocean, with views of Ireland’s highest mountain range, the MacGillicuddy’s Reeks. There are many courses in this accommodation. In between these courses the accommodation including a large activity room, can be hired for groups up to sixteen. The guesthouse has bedrooms for one, two or three persons. Either with ensuite bathroom or with common use of shower and toilet. The common space and the two conservatories offer a spectacular view over the ocean. There are a lot of extra's for guests like a fully equipped kitchen, tv with video and DVD-player, peat burning stoves, sashing machine and a garden with BBQ facility. Dingle Peninsula is the westernmost part of Ireland, with spectacular mountain ranges, peat moorland and wide seaviews. Seals, razorbills and puffins are a few of the species you will find here. Dingle has lot of interesting archaeological sites, such as the City of Fahan with standing stones and megalithic settlements. In lively Dingle Town you'll find Irish traditional music and seafood restaurants.